Laying sod is not only the quickest way to a lush green lawn, but it’s also the easiest way. While prepping your yard and laying sod can take the better part of a weekend, it beats waiting weeks, or even months, for grass to grow from seed. That being said, there are a few things to consider when choosing sod in order to ensure it has the best chance for survival. Take a tape measure with you when you go to pick out your sod. If it’s less than one-inch deep, chances are the roots are not established enough. Look for thick roots that expand the entire underbelly of the piece of sod. Those are the pieces you want to bring home. 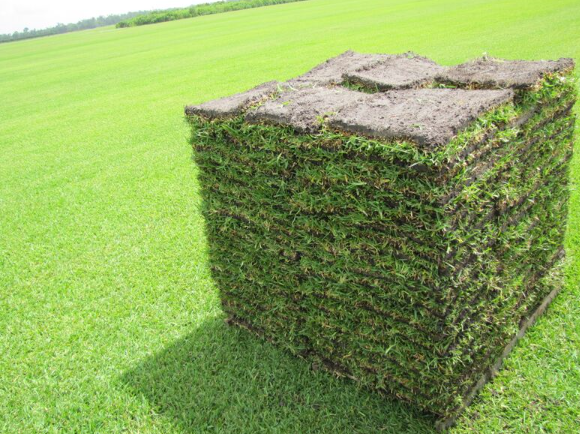 If you are choosing from rolled sod pieces rather than slabs, it should have the dirt on the outside and grass on the inside. This helps to protect the condition of your grass during transport. You should, however, unroll and inspect the grass side of the sod to ensure no weeds are present and that it’s a healthy green color. Don’t purchase sod that’s yellow or brown as it likely won’t survive long enough to take root in your yard. It doesn’t need to be dripping wet. But just as sod that’s been laid needs to be watered often, the sod that you choose should be moist if it’s going to successfully take root. Run your hands along the soil to make sure. When it comes to choosing sod, it’s not rocket science. Chances are you’ll know healthy, fresh sod when you see it. However, keeping these three tips in mind when you go to pick out your sod will have you well on your way to a beautiful new lawn. Follow us on Facebook and Instagram for more helpful tips!